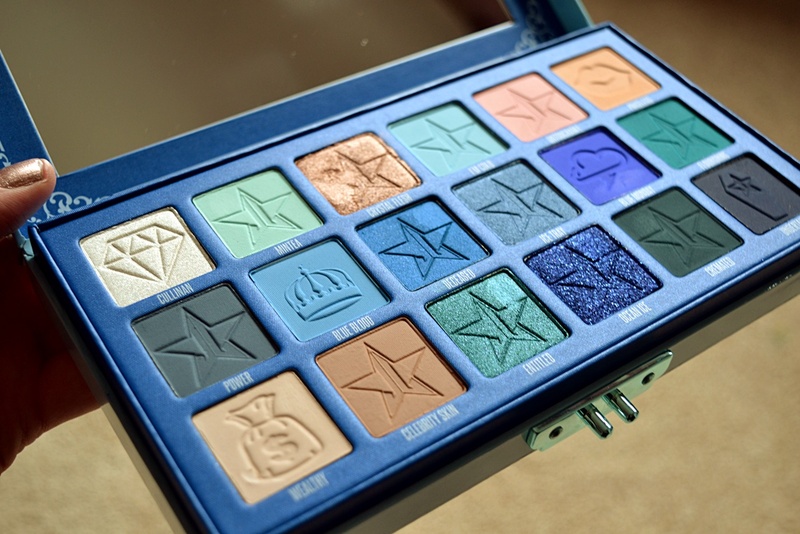 Guaranteed to be one of the most anticipated eyeshadow palettes of 2019, Jeffree Star’s Blue Blood has the beauty review community shook. Going boldly into blue and making the hue a commercial property for everyone (not just the brave), Jeffree loves to zig whilst others zag. With such hype and high expectations we purchased the palette for ourselves to see if it measured up. The first point that has to be discussed is the packaging. 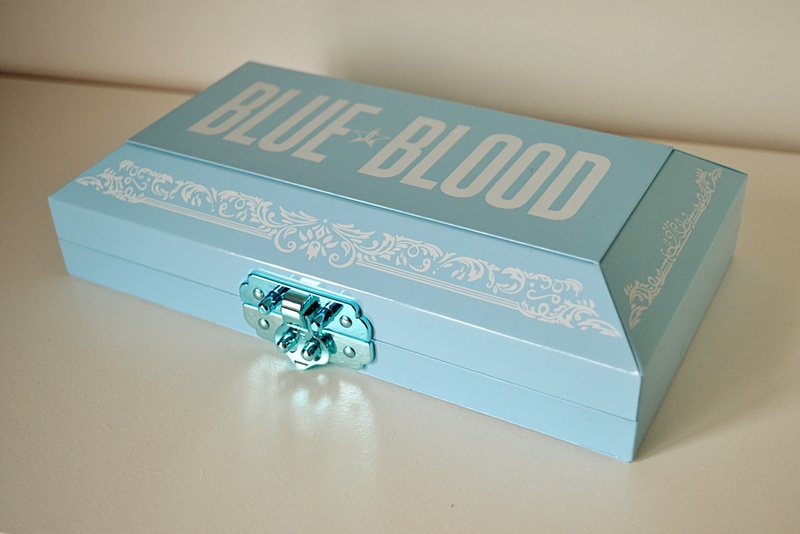 Jeffree loves to go for quality in his packaging and Blue Blood really does take things to a new level. 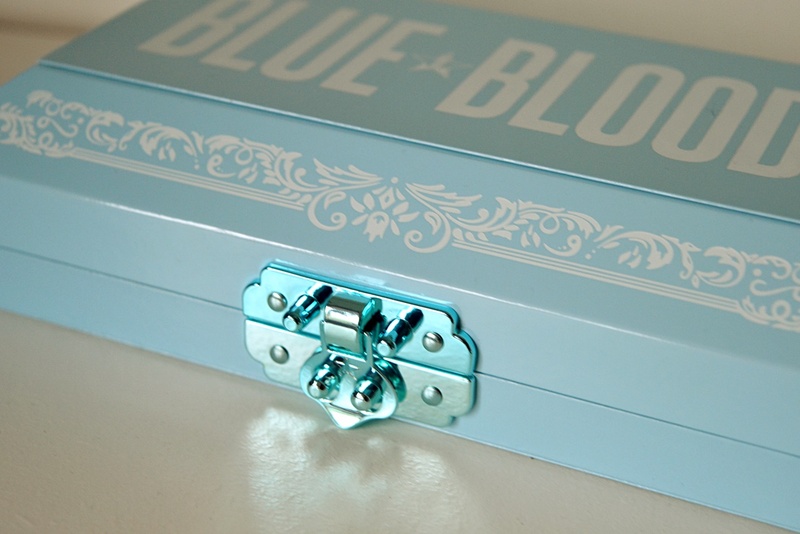 Set in a princess-like box, complete with metallic blue clasp to fasten, the palette has a coffin-meets-diamond shape to the outer. This overall gives a kind of wealth-meet-death theme, staying true to brand. The palette comes in a darker blue cardboard box, which has a wood effect print with large JSC logo. 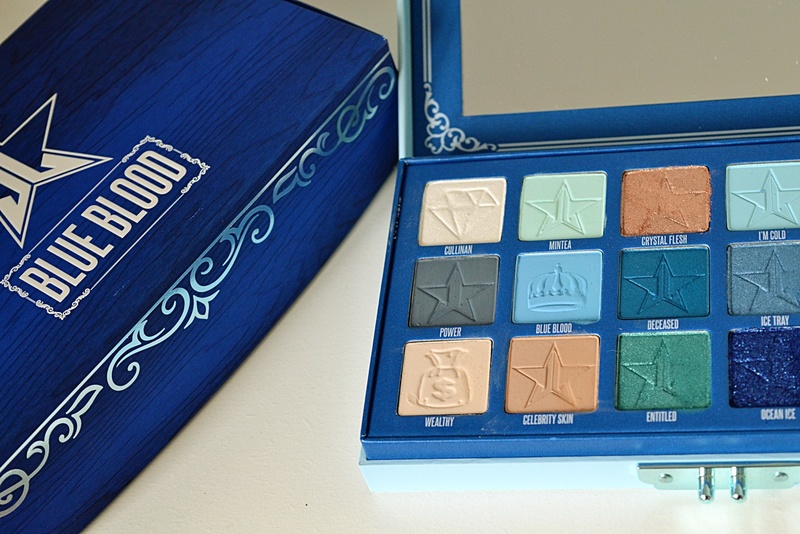 There were some complaints online that this palette was too bulky for most. After getting the palette ourselves, we disagree. As an 18 pan palette, you can’t exactly expect a small box. We’ll take the bigger size for the extra contents any day. This box is the same length and width as it’s sister palette ‘Blood Sugar’ but has added depth with the diamond effect lid. The weight of this box gives you a feeling of more value for money and you can still fit easily into a tote bag if you need to take it on the go. We envision the palette working best as a standout piece to sit atop your dressing table, where it can live for everyday use if required. With 18 shades to choose from, there is plenty to say about the colours included in the palette. Of course a varied selection of blue is provided (duh), ranging from rich royal blue to pastel sky blue. The other shades are all placed to complement the blue, with smokey hues like ‘Undertaker’ and ‘Cremated’ lending the perfect shadows to create a sultry eye. Some pastels and nudes are also present, deigned to set the base and accentuate alongside the blue hues. There are both matte and shimmer finishes included to swap between or mix and match accordingly. 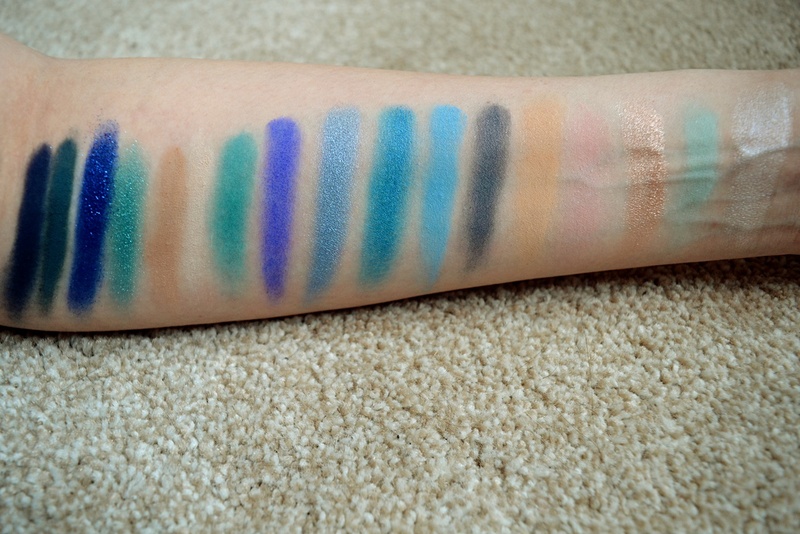 We found the mattes to be chalky in texture, the shade ‘Blue Blood’ in particular gave a strong, pigmented finish when swatched. The mattes performed well, the only shades that were a tiny bit lacklustre were the neutral shades ‘Wealthy’ and ‘Celebrity Skin’. As ‘Wealthy’ it was so close to my own skin tone it struggled to show up in our tests. ‘Celebrity Skin’ was similar, not having quite as much impact as the other hues on offer. These shades would most likely have better effect for darker skin tones however, so are not to be written off based on one skin test. The metallics proved to be the crown jewels of the palette, with the blinding finish truly stunning to behold. We can’t say enough good things about how pigmented and impressive the formula is on the metallic shades. It’s clear you get what you pay for not only with packaging but with the substance too. Just a little bit of product goes a long way, each of the shades makes an impact with little effort. ‘Ice Tray’ was a personal favourite, ideal for creating a snow queen inspired look. ‘Ocean Ice’ and ‘Deceased’ also had a beautiful finish that will inspire creativity in your make-up looks. Being proud Mancunians we also appreciated the aptly named ‘Blue Monday’ for it’s nod to New Order and it’s gorgeous neon colour. At £48.00 the palette is in the mid-range for most. It may seem steep to some but if you are into bold colours and trying new looks, it really is money well spent. Jeffree’s products are all made in the USA, his packaging is clearly good quality and you get a lot of product for your cash. 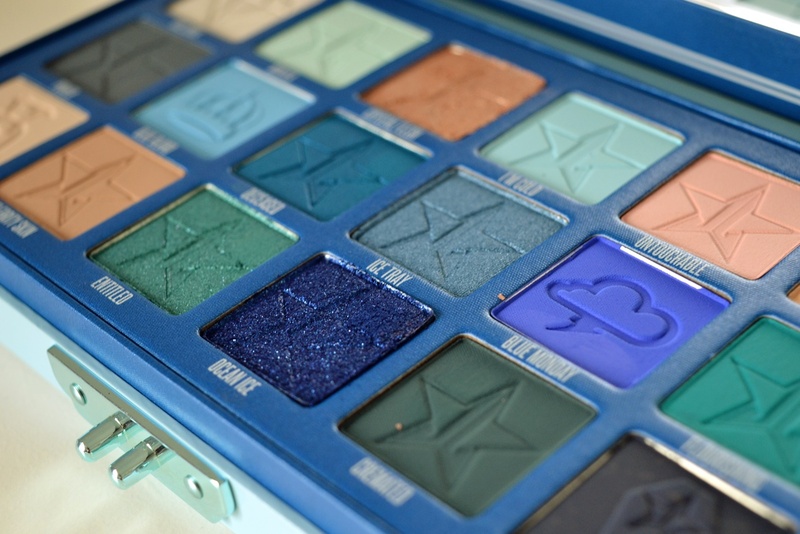 It’s not a palette you will wear once and forget about, Blue Blood really is an investment that has put beauty lovers back onto blue eyeshadow and we’d happily recommend it to anyone on the fence about purchasing. Blue Blood is currently sold out but Jeffree has promised plenty of restocks (we advise not to buy second hand and pay more). 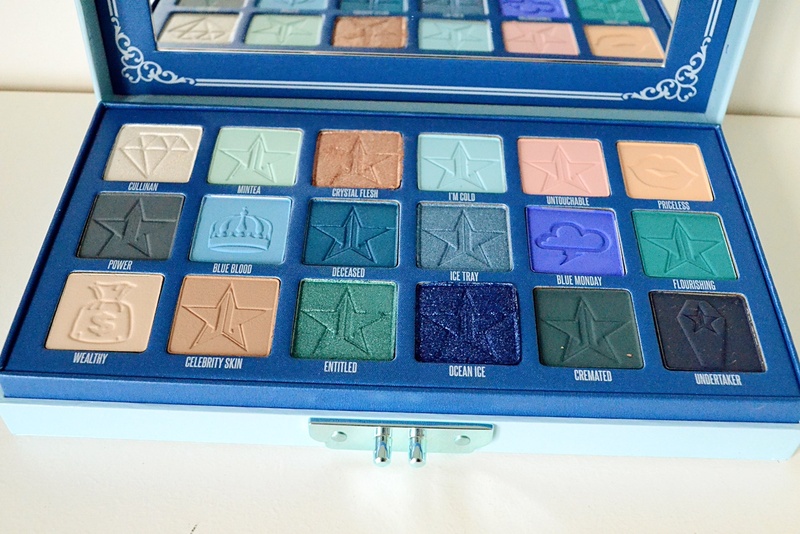 Keep your eye on Beauty Bay to bag a palette next time around. "The Ivy Asia Restaurant Review"